Stretching 1200 miles from the Atlantic port of Agadir east to Tunisia the Atlas form one of the world’s great trekking ranges. The High Atlas region in central Morocco is the most dramatic and beautiful section of the entire range. 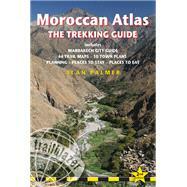 Includes full practical details – getting to Morocco, town guides and maps to Marrakech, Ouarzazate and seven other gateway towns. Routes covered on 44 detailed walking maps in the proven Trailblazer style; all walking times are indicated along with points of interest and gradients. A keen trekker, Alan Palmer is a Fellow of the Royal Geographical Society and a member of the British Moroccan Society who has been visiting the country each year for the last 25 years.